Time for a FUNNY FRIDAY!!! 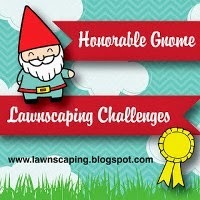 If you haven't been over to Marlene's Disguised as a Grownup blog yet, you need to do so. 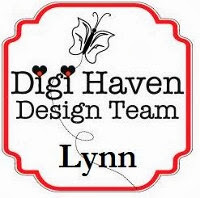 Become a follower and you won't miss out of all the cute little freebies AND you'll be inspired at the same time with all her creations. 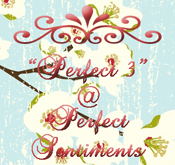 This was a free image she had one her blog a couple of days ago. Every time I'd think of this I'd just start laughing. 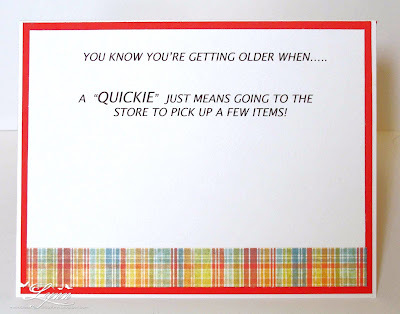 Now I will tell you though - this was NOT the original sentiment I had on this card. I figured I'd clean it up a little for my blog. I can just think of way too many cute sentiments to go with this one (some clean and some not so clean)! 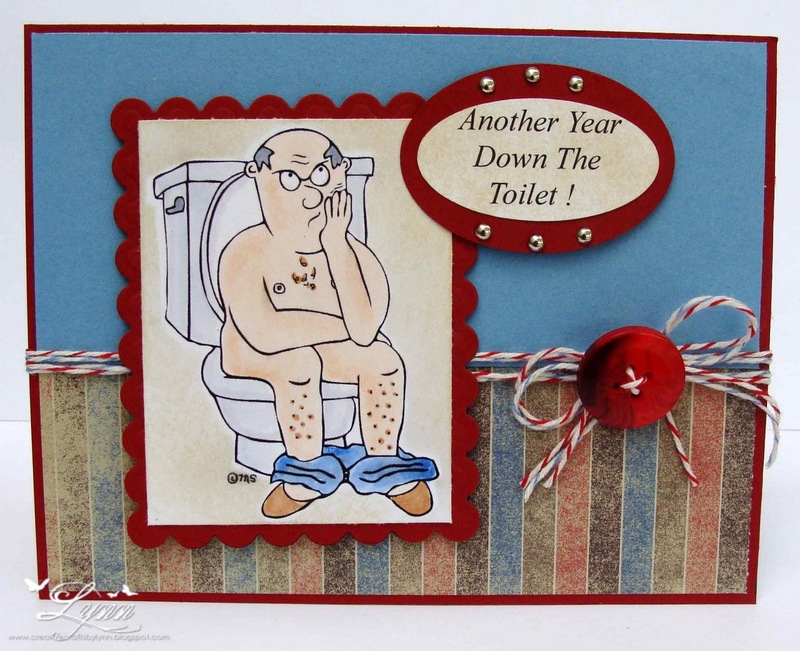 Just a really quick and easy card for one of the brother-in-laws birthdays. Thanks for stopping by......have a great weekend......and remember to SMILE! 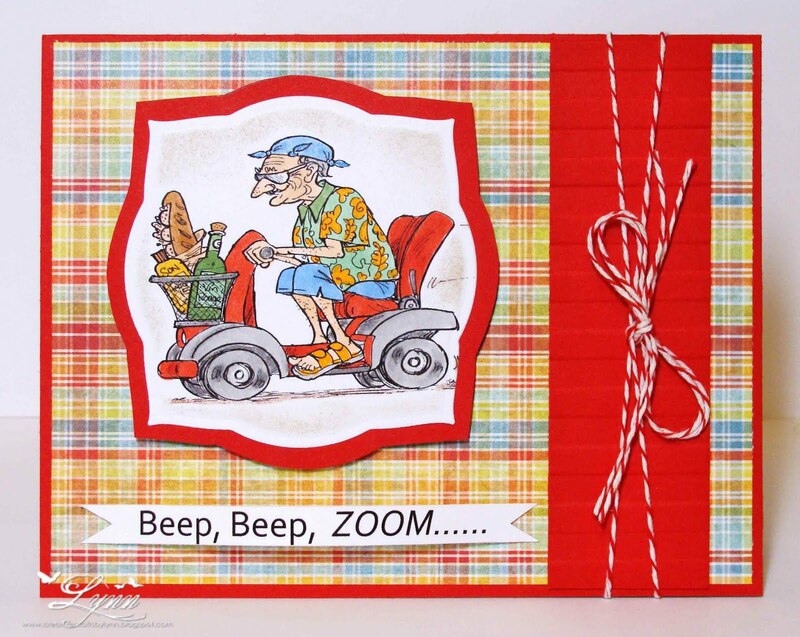 It's time for the New Release BLOG HOP over at Dude Time Doodles! The DT really has some fabulous creations with the new images. You can find all the images in the Dude Time Doodles store. The Hop doesn't have a starting an ending point so no matter where you are, you're in the right place. Be SURE and leave a little love at each stop because one of the DT members will be the Mystery Hostess.and one lucky winner will receive a PRIZE! In case you get lost along the way, just check the Dude Time Doodles BLOG. 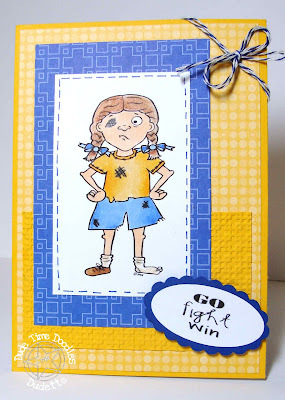 My first card is showcasing Knock Out Nancy. Is she precious or what! It looks like she really did "go", and "fight", but I'm not real sure yet out "winning"! She actually reminds me of myself as a young girl (except I usually WON)....I won't go into all the details here though. Next up is Wanda Witch! She's just perfect for this time of year - or maybe any time of the year if you need to send your mother in law a card (only kidding!). How about those orange shoes! When was the last time you saw a witch with orange shoes anyway! 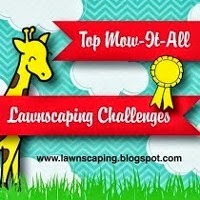 If you came from DAWN'S blog you're on the right track. Your next stop on the hop is LINDA. . 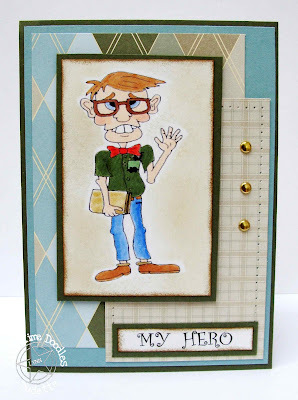 Thanks for stopping by.......and be SURE and check out the Dude Time Doodles blog hop and all the wonderful new images! 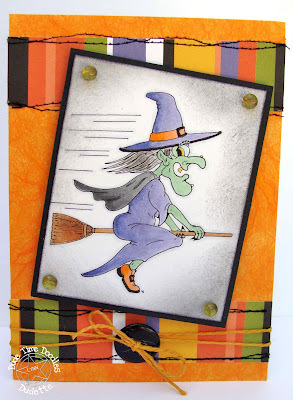 Another Halloween card - Grrrrrr....I'm almost to the point of slapping a bat in the middle of the card and then adding "ye olde bat" underneath it! But, on the bright side, I've almost finished all of them - and that's a good thing! 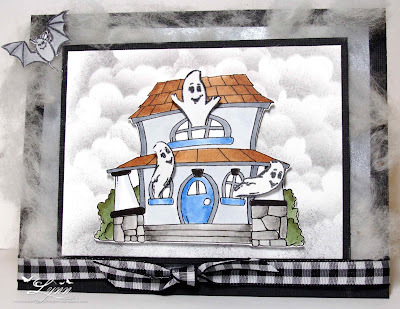 I used an old CTMH set on this called Happy Haunting. 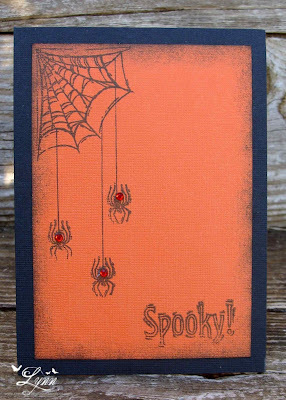 I'd finished the card and then decided those little spiders needed some red rhinestones on them - instant black widows. Eek....I hate spiders. For the progressive challenge over at the Hambo Hoedown we were given this cute little Pig Sub - if you didn't get the image free by playing in the last challenge you can always find it in the Hambo store. 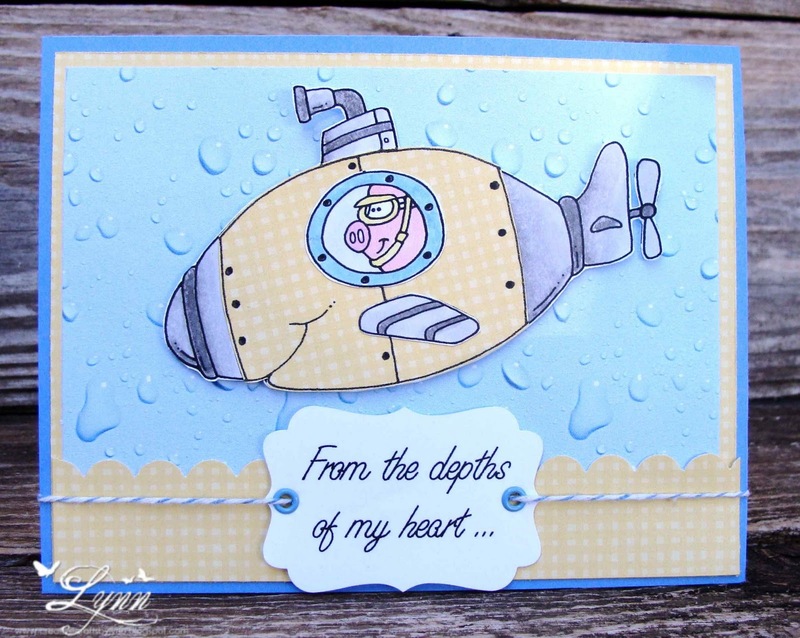 The challenge for this week is to make a card (using any Hambo image) for Operation Write Home. 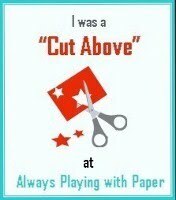 I kept this very simple by printing out the image and then doing a little paper piecing on it. Isn't that blue background paper with the bubbles on it just the best!! It's from Paper Studio and thought it'd look good on cards that needed some water - I'm not talented enough and way too lazy to try to "do" water otherwise! The sub was pieced with some very subtle yellow and white check - I just HAD to do the "yellow submarine"!. And how about that little piggy inside the sub! 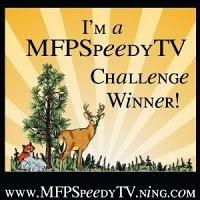 Thanks for stopping by........and be sure and check out the Hambo challenge. 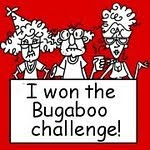 Time for another Funny Friday - BUT on a Thursday this week - thought I'd shake things up a bit! Nothing like a little moonshine to take you into the weekend, is there! This is another one of those cute images by Bonibleaux Designs and can be found in the Dude Time Doodles STORE. 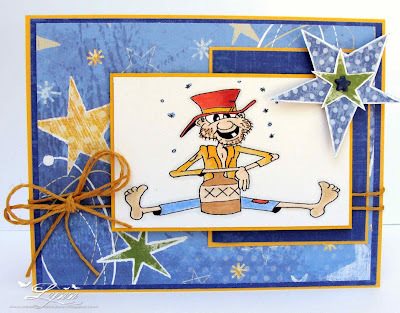 Mr. Hillbilly Moonshine has hit the jug one too many times and is seeing stars! I colored him with Copics and SU markers and paired him up with some DP from Close To My Heart. 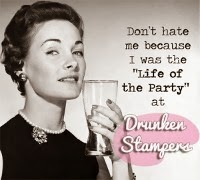 Thanks for stopping by............and have a great weekend (just don't hit the jug too much). 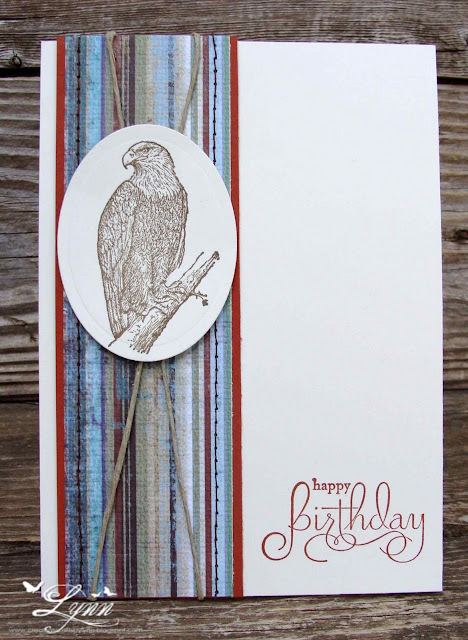 A very clean and simple card using one of the In Wilderness stamps from SU. I elected not to color this since it's pretty, as is.. The sentiment is from Well Scripted - also from SU. 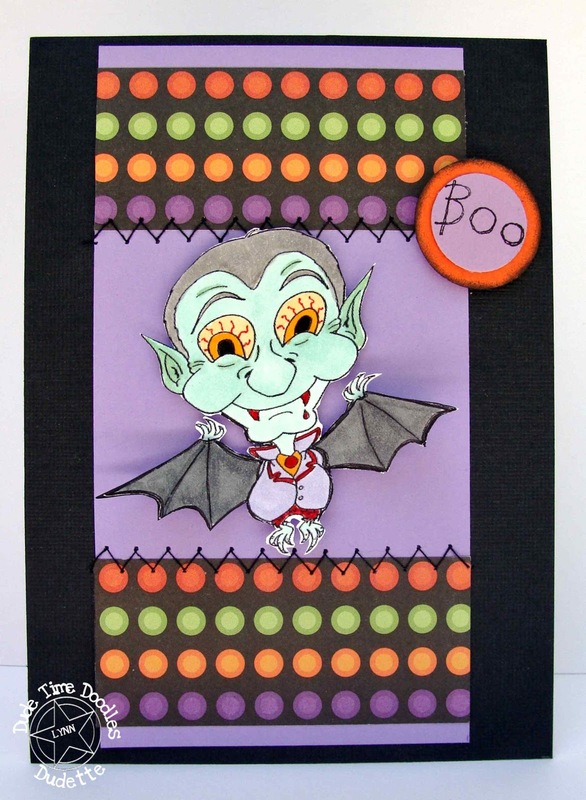 I used some Cajun Craze and Paper Studio DP. I don't think guys like a lot of frou frou and fluff on their cards and thought this would be a nice one - especially since I have so many masculine birthday cards to complete in the next two months. The sketch I used for this is from Lily Pad Cards. Be sure and check out this wonderful sketch on their blog. 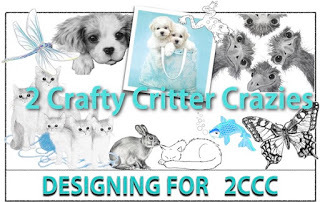 I'll also enter it in the challenges at Crafty Boots Challenges (things with wings), Totally Papercrafts (clean and simple), and Mami Doodles (all creatures great and small). 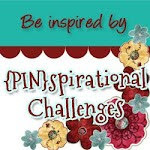 It's time for another Inspiration Challenge over at Dude Time Doodles. Show us your HERO! We all have so many heroes in our life - some big ones and some very small ones. 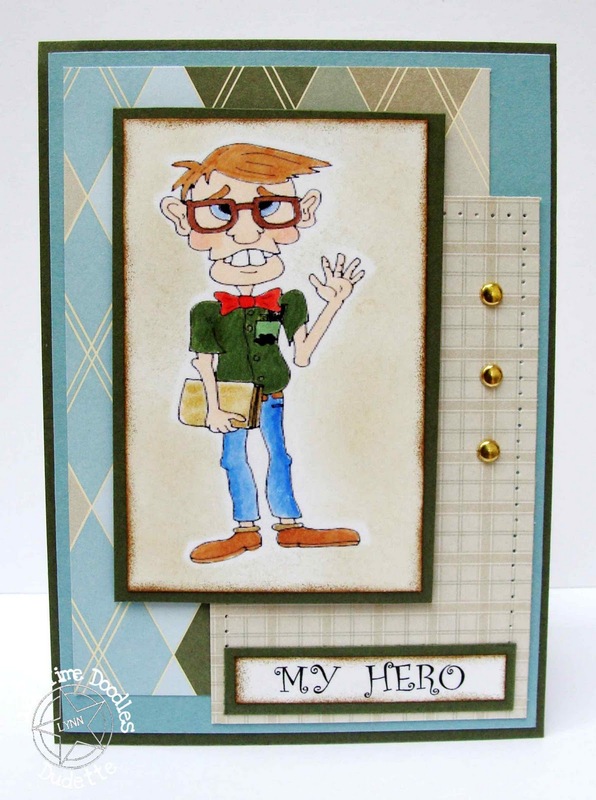 I've decided to showcase a card using Nerd Ned as he reminds me so much of one of the small heroes in my life. Ned looks like a computer techie and to me, someone with the knowledge to repair computers, is a hero! I think this will make a great card to give to my computer tech next time he repairs something on my computer that I've messed up! You can find Nerd Ned in the Dude Time Doodles STORE - along with so many other cute images. 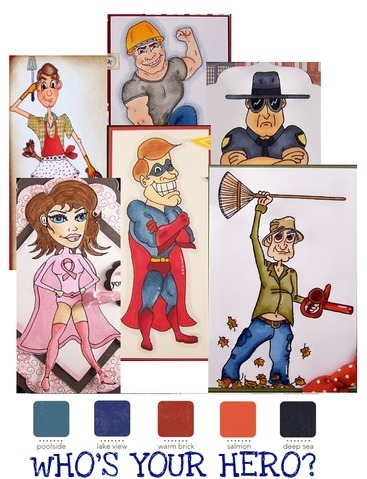 Check out DUDE TIME DOODLES and our challenge this week......we'd love to see who you consider a hero in your life. 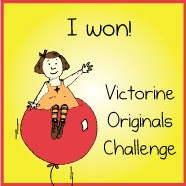 I'll enter this into the challenge at Crazy Challenges (men only), Fairy Fun Fridays (masculine) and last but not least, Cardmadfairy's Digis Days (lots of layers). 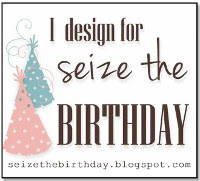 The challenge we're having this week at Stamps R Us is themed Birthdays! Our sponsor is The Paper Shelter. Our challenge is a little different this time. The theme is to make a birthday card for Operation Write Home. Make an A2 sized birthday card using any products for your cards except glitter and send it to one of the Operation Write Home shippers listed on the Operation Write Home main blog. 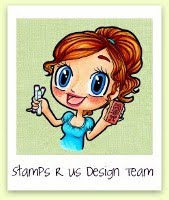 You have two weeks to submit your creation to Stamps R Us Challenges - and who knows....you may be the winner of a wonderful prize package from The Paper Shelter. 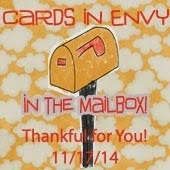 This was one of the Pre-Colored images we received from The Paper Shelter to showcase our cards for this challenge. Trust me - there's no way I could have colored it this pretty. Using a pre-colored imaged was a "first" for me but I enjoyed using it. I think if you're in a hurry to make a card for someone this is the route to go. 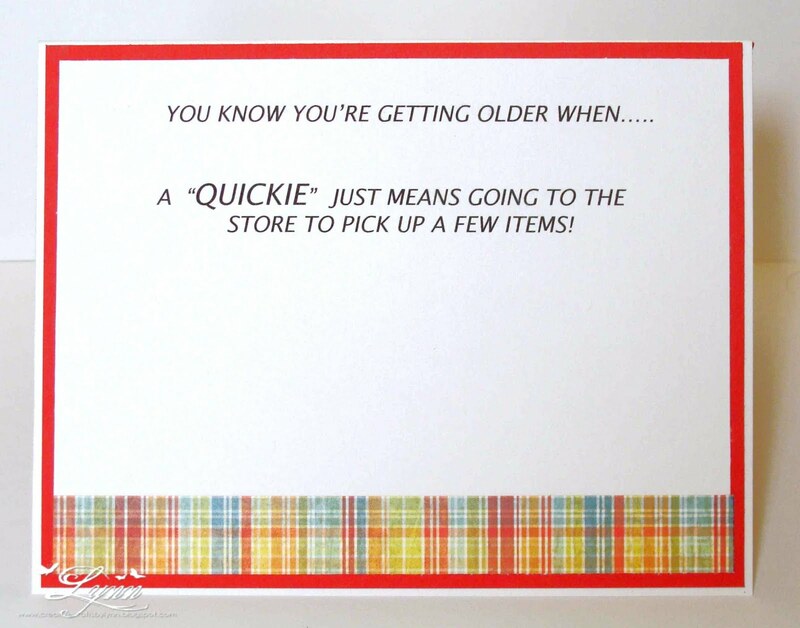 When I saw this image I thought of a young boys birthday card - and then I turned it around and added this sentiment so I could use it for an adults card. Kathy had sent me this piece of DP not long ago and I paired it with some Pacific Point (embossed with the Swiss Dots folder) from SU. To give it more of a western feel I added the burlap fabric behind the main image and the square brads. 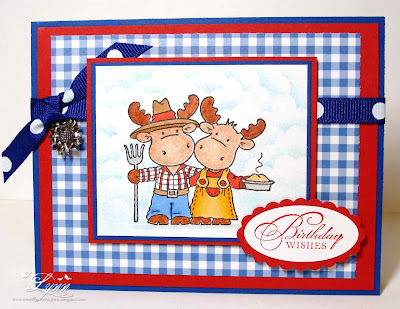 Thanks for stopping by............and be sure and check out Stamps R Us Challenges - and show us your Birthday creations! Yep, I've been picking cotton - at least somewhat. All the farmers around here that planted cotton are now harvesting it and there's cotton bolls everywhere! All you have to do is drive down the highway, and the road is just littered in cotton. It almost looks like snow! Anyway, I received my little House 2 image from Hambo for playing along in their progressive challenge last week and found that the challenge this week is to use something you wouldn't normally use on a card. I was completely stumped - until I thought of all that cotton laying around on the roadside. Bright idea.......I'll make a haunted house with the image and use the cotton like spider webs hanging down! It didn't come out like I originally planned but that's ok as nothing usually does. If you've never been around cotton, let me tell you - it's much better when you get a package of cotton balls in the store! The real stuff isn't very white at all and has all kinds of grass,sticks,weeds, and bugs stuck in it. It's really hard to work with and just sticks to everything. But here's my card with the cotton all around the main image panel (the idea here is to represent spider webs). The little ghosts are from a CTMH set and I made the gray clouds with Going Gray ink from SU. AND hubby didn't even mind getting out on the roadside and help me pick cotton! 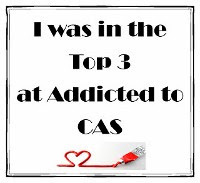 Thanks for stopping by..................and be sure and check out the Hambo Challenge. So much fun! 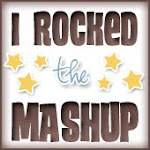 Also, there's still time to join in the Blog Hop at Hambo....check it out HERE. AND - last but not least - there's also time to join the challenge over at Dude Time Doodles! 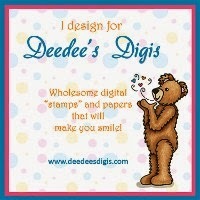 We have a FREE image for you to use and you could be our next Guest Designer. 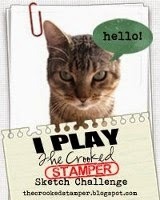 Welcome to "Sing Your Art Out" sponsored by Hambo Stamps! 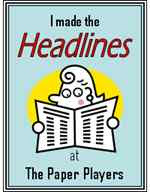 Hambo friends, customers, and the Bacon Bits DT are bringing you fun creations that depict song titles. If you've arrived here from JEN'S BLOG you're in the right place. If not, you might want to start back at the beginning at the Hambo Blog to make sure you're eligible for the hopper prize! A prize will be awarded to one participant whose song-themed creation tickles the Bacon Bits' fancy in a singin' wingin' way. 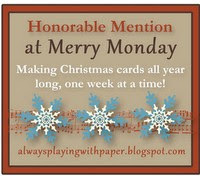 Another prize will be awarded randomly to a hopper who comments on all the blogs along the hop. The winners will be announced on the Hoedown Blog as well as on the Hambo company blog, Talk to the Ham, on Wednesday, September 21st. We're talking JAILHOUSE ROCK around here folks!!! You may remember......"everybody in the whole cell block was dancin' to the Jailhouse Rock....." by none other than that hip rolling Elvis! Yes, I actually remember all this but I was VERY YOUNG you know! (I guess I'm an "Oldie but Goodie" just like the song!) 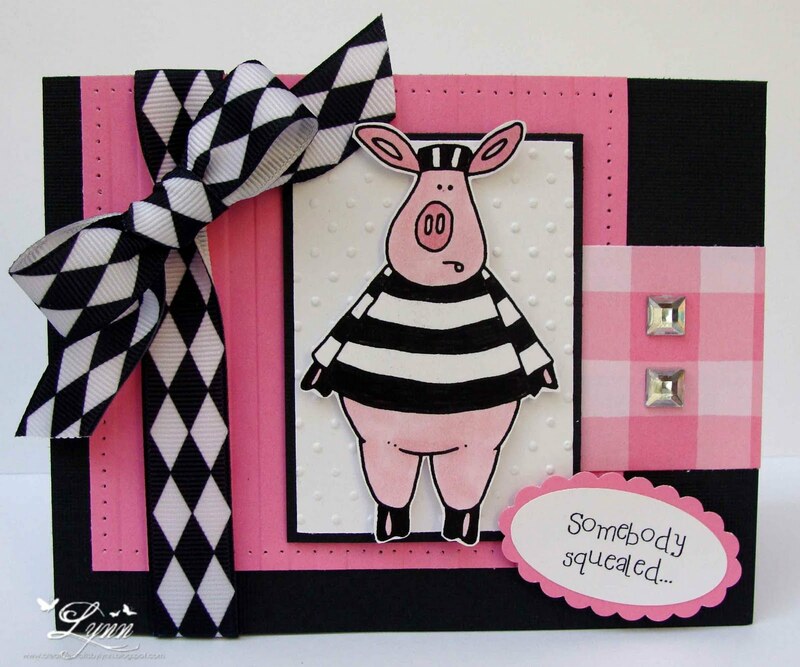 And what could be more appropriate than a card done with pink - thinking of that wonderful pink Cadillac that Elvis had. I just HAD to add those two square rhinestones too - Elvis always wore those glittery, sequined, outfits - remember! And ah, the sentiment "Somebody Squealed"! Every time Elvis would roll those famous hips, I, along with scores of other teenagers, would just swoon and SQUEAL in delight! So get on your dancin' shoes, warm up the vocal chords, swivel those hips and get prepared to sing! Your next stop on the hop is NORA ANNE who will also have you singing to your hearts content. Thanks for stopping by..........and have fun hopping! It's the second Wednesday of the month and that means it's time for a FREEBIE at Dude Time Doodles! 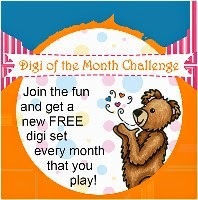 Head on over there and grab this CUTE image and play in the challenge. 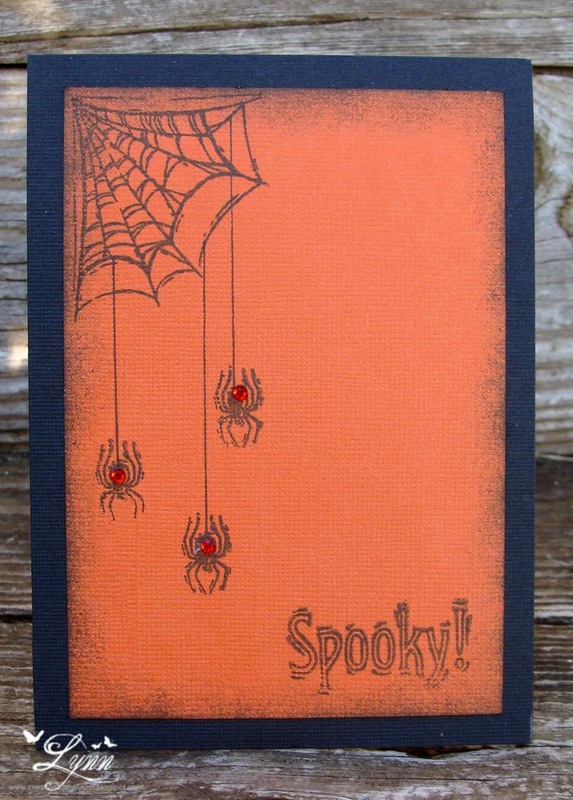 It's just perfect for all those Halloween cards you need. 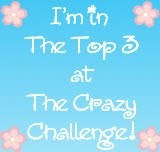 And who knows....if you win the challenge you could be the next Guest Designer for DTD! I printed out Mr. Bat a couple of times, colored them, and then cut both out. I just used the wings on the second image and popped them up on the first - and then again popped up the entire image. It's really hard to see but he looks like he's flying off the card. The card was completed with a little DP, stitching, and the Boo! Thanks for stopping by......and be sure and go to Dude Time Doodles, grab this cute image, and play along this week. 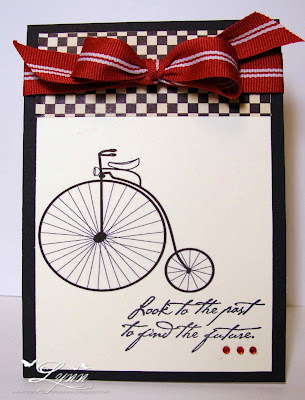 My past does NOT include bicycles this old - however I do love them. Can you image how much fun it must have been to ride one! It was probably a little tricky getting on it, but once you did I'm sure they were fun. 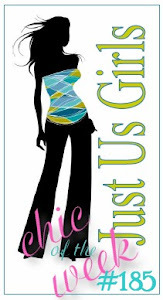 This is a digital image that I found on Beyond the Fringe blog by Carmen. She does beautiful work. The sentiment is from a set from CTMH. I had this card pictured in my mind and it actually came out very close to what I was thinking. Maybe next time I'd put the sentiment directly under the bicycle and scoot it over to center it on the card though. I also started to color just the seat of the bicycle but thought that the ribbon and the rhinestones picked up enough color. How about a cute little "Riley" couple to take you into the weekend! We're talking about a little "down home cooking and gardening" around here with Mr. and Ms. Riley. I recently won an image in a blog hop that was being held over on the Riley and Company blog and just had to pick this one. They actually remind me a lot of my husband and myself! Well, maybe we don't really look like a moose, but we do love to cook and dig in the dirt (garden). Thought this would make a cute birthday card - clean and simple AND quick. Thanks for stopping by............and have a wonderful weekend. Hambo Hoedown's progressive challenge this week is all about the hues of Autumn. If you didn't play along last week in the challenge you can still get this cute little image (Flowers) at the Hambo store and then play this week. I'm so ready for Autumn it's not even funny around here. After so many HOT days in Texas this summer, I'm ready to see cooler temps - and quick! I have a whole slew of family and friends that are having birthdays in the next couple of months. 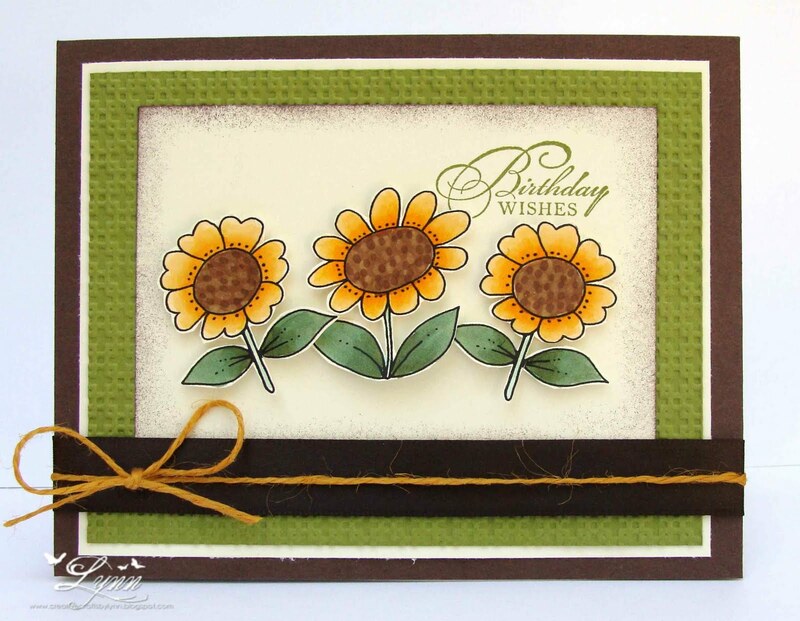 So when I saw the pretty little flowers from Hambo I knew I'd have to make a birthday card. I used Very Vanilla, Chocolate Chip, and Old Olive card stock from SU. I used two of the three flowers images, colored them with Copics, cut them out, and popped them up on dimensionals. I used the Square Lattice embossing folder from SU on the green. That's a piece of chocolate brown ribbon at the bottom with hemp twine run across it and then tied in a bow. (Why does brown ribbon always photograph in black for me!) 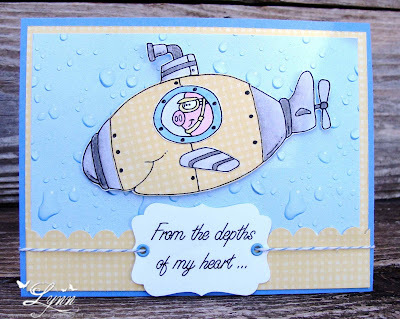 A little sponging was done, the sentiment stamped, and card completed. It's time for the monthly Sketch Challenge at Dude Time Doodles. 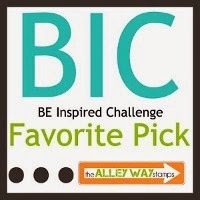 You have one week to flip the sketch, twist the sketch, work the sketch, and submit your creation. You're not required to use a Bonibleaux Design image although it always makes us happy when you do. Check out the sketch on the Dude Time Doodles Blog! It MUST be masculine themed. 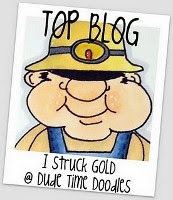 So head on over to the Dude Time Doodles blog and join in on the fun. 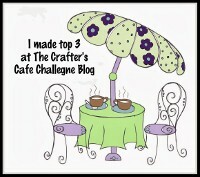 Who knows, you could be the Top Blog or one of the Top Three for the week - and the Top Blog will win a prize. Cowboy DOWN with Deputy Dave! You can find him in the Dude Time Doodles STORE - along with a whole bunch more cute images. Poor Dave is not only old and shrinking, but has also been riding a horse for too many years and as he legs get more bowed, he just keeps getting shorter. His shirt and jeans are all faded out and the boots have seen so much wear and tear you can hardly tell what color they originally were. 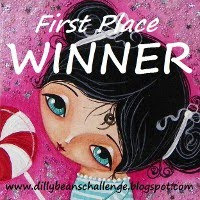 Thanks for stopping by..........and head over to DTD to check out the sketch and then submit your entry. 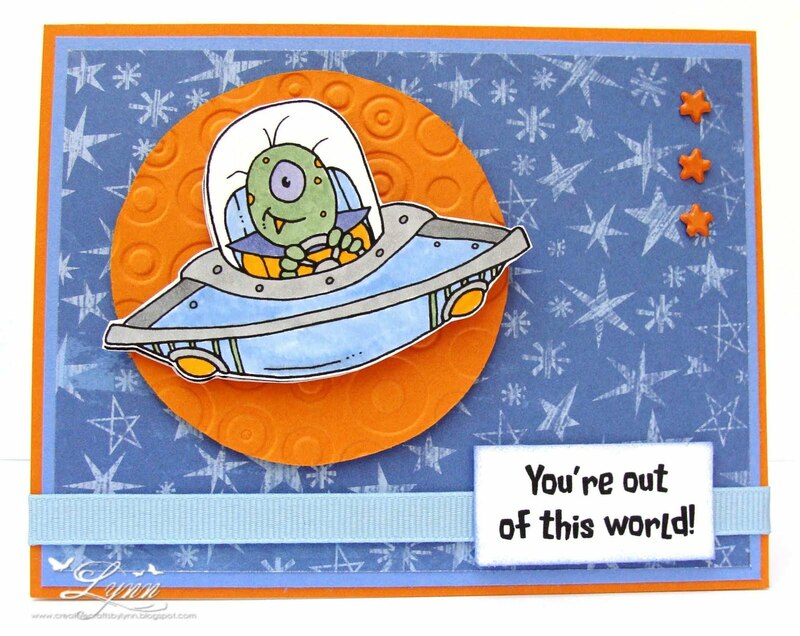 Our challenge, beginning today over at Stamps R Us, is themed Friendship. Come on over and submit your entry for a chance to win a fabulous prize from our sponsor, Karber. This is just one of the cute images you can find in the Karber store. Isn't she just the cutest little thing with those great big glasses. She looks so studious! I colored her with Copics and am still trying to get that hair coloring down better.....maybe I'll just have to say forget it and go back to the Prisma pencils - which I love. Ah, but there's nothing like a challenge - so I'll keep trying I guess. 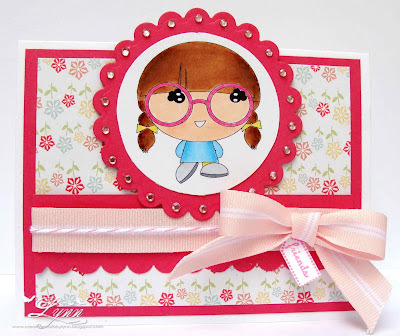 Very simple card using a scrap piece of paper and some pink card stock. I placed a few rhinestones around the scallop circle since it's pretty much a "girlie" looking card. 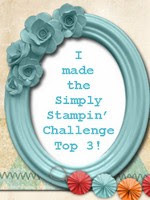 Thanks for stopping by and be sure and enter the Stamps R Us challenge! 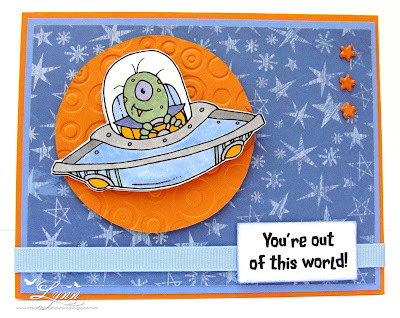 For the progressive challenge over at Hambo Hoedown, we were given this cute little alien spaceship to use for the theme this week - another dimension. If you didn't play in the challenge last week, you can purchase this image from the store. 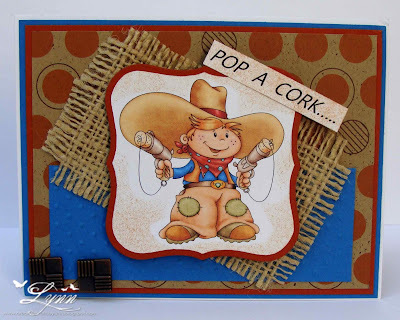 Come on over to Hambo Hoedown and join in on the challenges - they're really a lot of fun. I kind of feel (and probably LOOK) like this little alien after all the company we've had this weekend...and another wave of it will be in later today and then leave tomorrow! Yikes! Anyway, I've used some CTMH DP and Pumpkin Pie and Ballet Blue card stock from SU. I cut the orange circle and then embossed it - and popped it up on dimensionals. The image was stamped twice, colored, and both "popped up" on dimensionals. He looks a little "in flight"! Time for another Funny Friday!! A couple of years ago my husband had some very serious medical problems and due to his weakened condition and a bad back he decided to try using one of the scooters when we went to Walmart. I got him all situated in it and we figured out how to operate the thing and off we went. He did pretty good until he got to the first turn which happened to have a display rack there........wipe out!! Ok, so I'm helping the clerk pick up everything and just kept saying "I'm sorry, I'm sorry"! I turned around and hubby was no where in sight - went looking for him - and just followed the trail for things he had hit laying in the middle of the aisles.....At every stop, all I could say to the clerks as I was helping them straighten up was, I'm sorry! Amazingly he'd only hit ONE person! By the time I got him out of the store I felt like my name was SORRY! This cute little image is from Just Inklined. They have so many fantastic images to choose from. 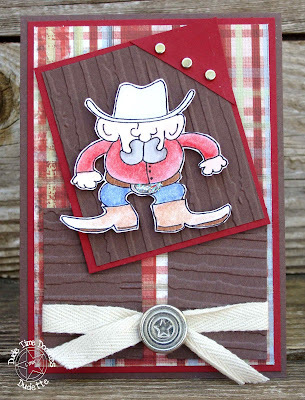 I used one of the Label nesties and on the red strip used the stripe embossing folder from SU. 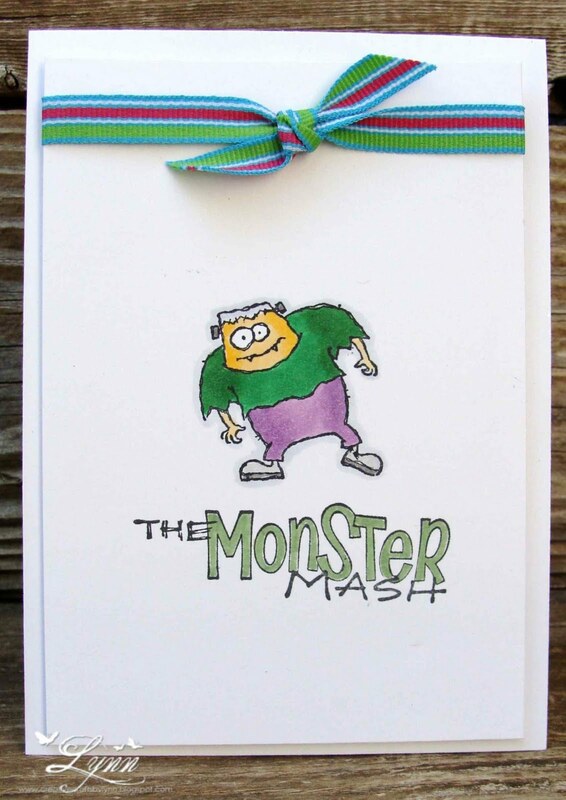 Of course this little card wouldn't be complete without a sassy little saying on the inside too. 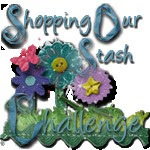 I'll enter this in the Shopping Our Stash challenges (theme Humorous). Hope this puts a smile on your face..........have a wonderful weekend. Just a note: I had company come in yesterday so I'll check back with everyone on Sunday or Monday. 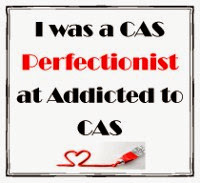 Just a very CAS Halloween card. It's not a one-layer deal - still having some issues with those things (like using up a ream of card stock trying to get them perfect). The image is from SU's Booglie Eyes and the sentiment from Studio G. A really quick and easy card for one of the nephews for Halloween. Thanks for stopping by..........and get ready for another Funny Friday tomorrow!